Throughout 2009, I recorded several dozen statistics about a) the pop culture I consumed, b) the people I talked to, c) the beer I drank, d) the places I visited, e) the vehicles I took to those places, and f) the amount of sleep I enjoyed each day. Those statistics spread across several thousand cells of a spreadsheet, which I then condensed and animated into the 2.5-minute video clip embedded below. That process took about a month, all told, which isn’t a ratio I’m proud of, even if I’m happy with the result. Dan Meyer’s 2009 Annual Report from Dan Meyer on Vimeo. I’ll add a post shortly after this one that will address some technical notes I made throughout the process. Nicholas Felton’s 2009 annual report has already been widely linked. I pass it along, though, with my recommendation that it’s the best of his four reports. He relinquished his usual role as data collector to the friends and acquaintances he met in 2009, asking them to respond to the same web survey and answer questions about Felton’s mood, location, activity, and conversation. Felton’s technical feat here is astonishing. It’s challenging enough to track a data set in a spreadsheet of your creation, organized according to your own tastes. This year, Felton had to organize and visualize data no matter how his friends decided to submit it. And in spite of that loose chaos he has designed some exceptionally lucid visualizations while also experimenting a bit with form. (He used topographical maps to represent New York instead of his usual cluster plots.) I couldn’t quickly decipher his cover-page infographic but realized eventually how he was graphing the duration of his relationships across time and found the whole thing vivid and melancholy. Felton stocks the sidebars of every page with his collaborators’ exact reports (“I think it’s funny that Nick carries a backpack.”), which is an affectionate design choice. If his previous work could be described as a staggering act of introspection, this is their equal in extrospection, a study of friends and relationships. I suspect, in ten years, this will be the one he returns to first, and most often. BTW: See this interview with Nicholas Felton. A youth group with 26 members is going to the beach. There will also be 5 chaperones that will each drive a van or a car. Each van seats 7 persons, including the driver. Each car seats 5 persons, including the driver. How many vans and cars will be needed? Tuesday was an all-school professional development day. The math departments joined from two campuses to learn about the Gradual Release of Responsibility from a couple of math coaches from the next county over. One coach modeled a GRR lesson and opened with the problem above. We broke for lunch and came back to debrief. No one had commented on the problem by the end so I did. “I see problems like this and I feel myself becoming less of a human and more of a math teacher. And I feel very lucky to teach our neediest students, students who punish me daily for problems like this one, students who are often very hard on me but who in return have helped me hold onto some of that humanity. “One, is the problem realistic? Would a real person need to solve this problem? “Two, is the solution realistic? Would a real person solve the problem using a system of two equations? This is a problem you will only find in a math textbook. It’s bizarre to me how many different ways just fifty words can fail to square with reality. Why does each chaperone have to drive? Why can’t we take five vans? Why do our vehicles have to seat the exact number of people in our group and no more? No youth group leader would ever solve this problem with a system of equations. I’d wager that no math teacher, if somehow faced with this completely fantastic scenario, would solve this problem with a system of equations. With 31 people, we’d just shuffle them around until they fit. Even if we insisted on the contrivances in #1, there are only [0, 5] possibilities for the vans so we’d use a table or just guess and check. ¶ I asked the coach why we were forcing the issue of systems when the easiest solution by a long shot was tables. She replied that we learned tables last class and this is the new skill we’re learning. Algebra teachers sell students a cheap distortion of the real world while insisting at the same time that it really is the real world. The cognitive dissonance is obvious and terrible. Students know the difference. It cheapens my relationship to them and their relationship to mathematics when you ask me to lie to them. It’s like offering someone lust or manipulation while insisting that it’s love. Not only are the short-term consequences devastating but it makes that person distrustful or wary of the real thing. Make no mistake. We are making an alien of algebra. We are doing real damage here. I still may drive to your house. 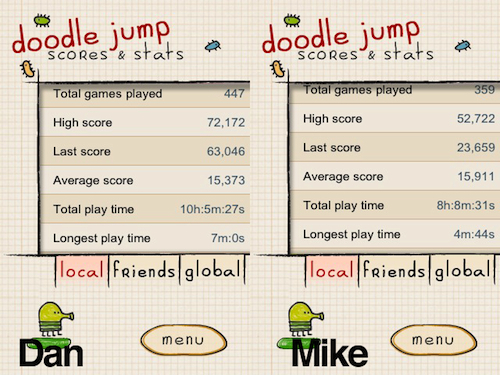 Who is better at Doodle Jump? Mike or Dan? Why? The first semester ended, not with a bang, but with two days of canceled class… because you can’t be too careful with those Santa Cruz tornadoes. and two days of hasty final exams. My remedial Algebra class spent a lot of time this semester on what California calls computational fluency and what I would rather call the awesome descriptive power of numbers. Which has meant, thus far, everything from times tables to proportions to infographics all leading to the motivation for the question above: when your friend is being kind of insufferable about how good he is at Doodle Jump, you can use numbers to shut him up! It is a feature not a bug, in my opinion, that Mike and Dan can draw their own self-serving conclusions from the same set of numbers.